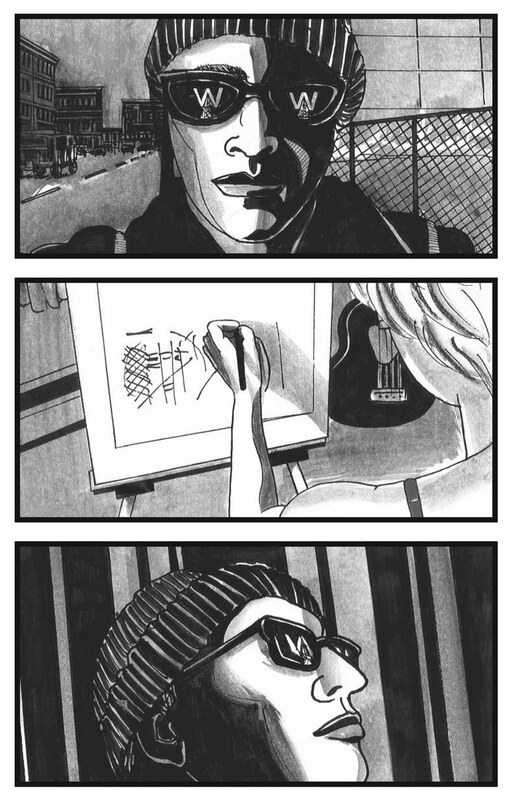 A sample page from David Lester's compelling graphic novel, The Listener. Nine boxes of books arrived in the afternoon. David Lester hauled each heavy box up the stairs to his third-floor apartment in eastside Vancouver. And there they sat. Hour after hour. He could not bring himself to open a single carton. The boxes contained copies of his graphic novel fresh off the presses. The books were the end result of a project started years earlier, a laborious process involving thousands of sketches and detailed final drawings in stark black and white, rendered in pencil and pen ink, watercolour and acrylic paint. After a long, intimate relationship with each drawing, the work had been sent off to the printers. Too much ink and the images would be blobs. Too little and the book would be a washout. It is a circumstance familiar to any parent. You nurture your darlings before sending them off into a cruel world. After eight hours, he could wait no longer. He slashed open a box just before midnight, holding in his hand a copy of The Listener, a graphic novel published by Arbeiter Ring of Winnipeg. Next, he was dancing a jig of happiness. 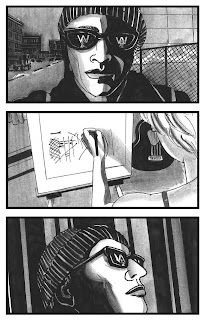 The illustrated story, which is set in Vancouver, opens with a man accidentally falling to his death while trying to hang a banner with a political message from the old Woodward’s sign — a revolving red neon W atop an Eiffel Tower-like structure. The man’s desire to hoist the banner was inspired by a sculpture, his death causing the artist to flee to Europe to escape her guilt. On the continent, she meets an elderly couple who tell the story of the last free election held in a small German state under the Weimar Republic, a campaign in which the Nazis claimed a narrow plurality at the ballot box through thuggery and intimidation. It is this victory, however modest, that Hitler uses as leverage in convincing the president to appoint him chancellor. The artist sees in that history a cautionary note for our own time, which has not been immune to official deceit and spin-doctoring with tragic consequences. The Listener’s early reviews have been harsh (“the artist’s limited powers can’t do justice to his ambition,” said the Winnipeg Free Press), straightforward (“a shadowy morality play cloaked in German Expressionism,” noted the Pacific Northwest Inlander), and glowing (“as a graphic novel, it raises the stakes of the whole genre ... a launch into the big leagues,” said the Victoria Times Colonist). The 310-page book is a major step for the artist, whose work will be familiar to many in Vancouver. Mr. Lester’s designs have graced T-shirts and album covers. He created some of the earliest punk rock posters in Vancouver before designing theatre posters. 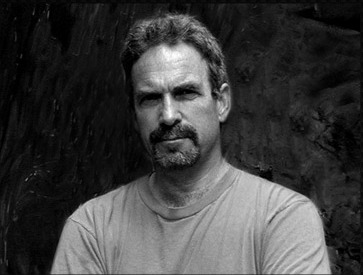 He is also the longtime designer of the quarterly literary newspaper BC BookWorld. The son of a postal worker and a homemaker (and the grandson of a Scottish immigrant who played horn in a band sponsored by the radical Industrial Workers of the World), he was raised in east Vancouver near Rupert Street and east 29th Avenue. His early reading included Mad magazine and Classics Illustrated. An older brother who worked at the Georgia Straight newspaper brought home stacks of underground and alternative newspapers, a library of garish, stunning and provocative images that also influenced the budding artist. Mr. Lester, 53, is also a guitarist, early in his career performing with a band that opened for Talking Heads. He is better known as a longtime member of Mecca Normal, a duo in which he plays guitar to the vocalizations of Jean Smith. Confrontational and provocative in lyrics and sound, the combo is credited as helping define the spirit and sound of the early Riot Grrrl movement. They’re not to everyone’s taste and Ms. Smith has memorably described Mecca Normal as “the Buckley’s cough syrup of rock.” The pair have opened for DOA at the Smilin’ Buddha Cabaret in Vancouver and have performed with the likes of Fugazi, Sonic Youth, Bikini Kill and Sleater-Kinney. Rolling Stone magazine included them with newcomers Radiohead and Liz Phair in a 1993 guide to cool music. 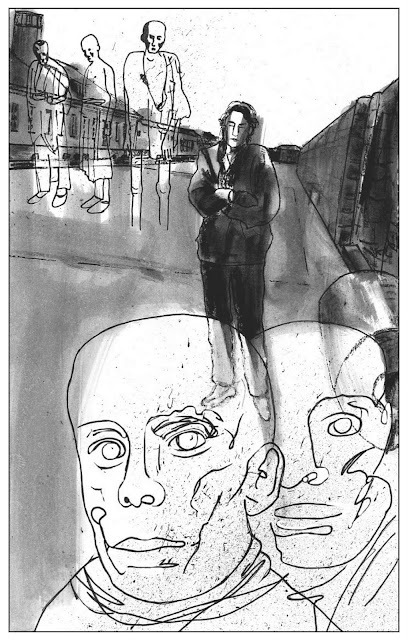 Ms. Smith has developed a performance adaptation of Mr. Lester’s graphic novel, which will be presented at the Word on the Street festival in Vancouver in September. The show includes PowerPoint slides of Mr. Lester’s drawings. What was it like to capture in ink a maniacal tyrant responsible for so much tragedy? Still, he mitigated the awfulness of portraying the Nazi leader by basing the novel’s lead character on his wife — Wendy Atkinson, programming manager at the Chan Centre for the Performing Arts. David Lester discusses the stories intertwined in his graphic novel, The Listener. This posting has been edited to credit the "cough syrup" description of Mecca Normal to Jean Smith. 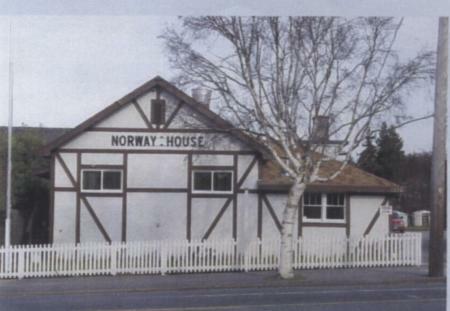 Expatriate Norwegians purchased a one-room schoolhouse on Hillside Victoria to be their clubhouse in 1947. It has since been expanded with additions. Last week, the Norwegian flag was lowered to half-mast. Jim Hall puttered about on a fine day when an email snapped him to attention. An explosion had rocked government buildings half a world away. He would spend hours on the computer, day turning to night, as, like so many of us, he sought news about a terrorist attack in a land known for peace. Mr. Hall, 57, is president of the Eidsvold Lodge of the Victoria chapter of the Sons of Norway, an international fraternal group whose membership includes the largest number of Norwegians outside Scandinavia. He sent condolences to group members in Oslo and he felt relief when he heard about the wellbeing of a member formerly from Victoria whose workplace was only a block from the explosion. Like many, he struggled to make sense of the senseless. After he spoke, the death toll among youth at camp held by the ruling Labour party rose to 86. Police have arrested a far-right nationalist and anti-Muslim extremist in the two attacks. Until their world turned upside down on Friday, the biggest news in the expatriate community featured the stellar performance of a pair of Norwegians — Thor Hushovd and Edvald Boassen Hagen — in the grueling Tour de France bicycle race. Many other British Columbians have been following the sport, too, especially to track the progress of Victoria’s Ryder Hesjedal. On Tuesday, the trio ended the day’s racing together, with Hesjedal’s selfless work allowing teammate Hushovd to claim the stage. An English-language news site based in Oslo hailed Hesjedal, a 30-year-old Victorian, as “the third Norwegian cycling hero.” As it turns out, his great-grandparents were immigrants from Norway. Flowers left by mourners fill an Oslo street. The Norwegians who found their way westward to British Columbia usually found work in the woods, or on the sea as fisherman and mariners. The Scandinavian country and a province by the Pacific have much in common — spectacular scenery with fjords and mountains, a bounty provided by the sea and by forests. Even the populations today are roughly equal. Earlier this year, the British Columbia Viking Ship Project marked the tenth anniversary of the launch of the Munin, a half-size, working replica of the Gokstad Ship, an 80-foot-long vessel found preserved more than a century ago in an ancient burial mound on the Norwegian coast. (The fund-raising campaign had as its motto: “Take a liking to a Viking.”) The Munin (pronounced mew-nin) sails on weekends from a moorage next to the Maritime Museum in Vancouver. The Sons of Norway have 2,000 members in 20 active lodges in B.C., including four on Vancouver Island. The Victoria lodge was founded in 1946, a year after the homeland was liberated from Nazi occupation, during which the surname of collaborationist leader Vidkun Quisling became a synonym for traitor. The Victoria lodge purchased a one-room schoolhouse on Hillside Avenue, later adding two small additions, as well as a hall. The 250 local members take language classes, form bowling teams, conduct folk dances, organize a choir, and celebrate Syttende Mai (Norwegian Constitution Day) with a parade on or near May 17. Among the upcoming events are Leif Erikson Night in October and the big lutefisk dinner in November. It is all so innocent compared to the horrors in Norway. On a day when parents in a far-off land gathered to reunite with their children, or to identify their dead, Mr. Hall sought a gesture to express the lodge members’ feeling of grief. At the hall which Norwegians consider a home away from home, Norway’s tricolour flag was lowered to half-mast. Simple, but profound. 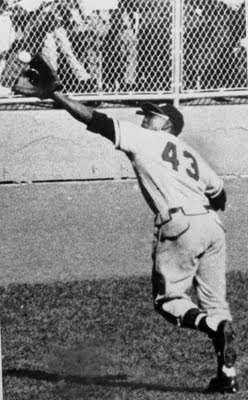 Wes Covington reached backhanded over his head on a full run to snag Bobby Shantz's drive in the second inning of Game 2 of the 1957 World Series. It was the first of two spectacular catches Covington made in the series. Baseball scouts were unanimous in accessing Wes Covington’s skill — he could knock the ball a mile, but his ability to catch was suspect. Scouts said he was nonchalant, distracted, and lackadaisical in patrolling the outfield grass. In baseball’s shorthand, he was good hit, no field. “They said I couldn’t catch a ball in a wicker basket,” he once complained. Despite this unfavourable assessment, Covington showed great athleticism when it counted the most. He earned the eternal gratitude of fans in Milwaukee by helping the hometown Braves win a world championship with two spectacular catches in the 1957 World Series. A gregarious, confident man with a rich baritone and an ever-present smile, Covington endured the tribulations of professional baseball’s slow and uneasy erasing of the colour line. Some white baseball writers detected in the young athlete an “unbecoming cockiness” — perhaps a judgment on a rookie’s self-assurance, or perhaps an expression of resentment at an African-American confident of his talents. Covington went into business after his playing days ended, eventually moving to Canada, where he established himself in Edmonton, his home for more than a quarter-century. Covington attended the all-black Hillside High in Durham, 180 kilometres north of his hometown, where he starred on the basketball court and football field, as well as on the track, recording a stellar 9.9-second time in the 100-yard dash. He intended to play professional football — the New York Giants expressed interest — but a knee injury made him doubtful about his prospects. Instead, he signed with the Boston Braves of the National League, a struggling franchise destined to abandon Massachusetts for Wisconsin at the end of the season. 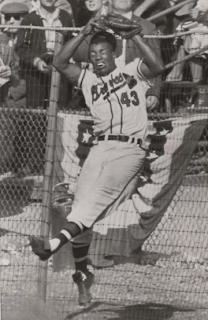 The Braves assigned the 20-year-old prospect to their farm team in Eau Claire, Wis., where he was joined by a teenaged shortstop by the name of Henry Aaron. While white players roomed with white families, the duo joined black catcher William (Julie) Bowers in staying at the YMCA. Local residents tended to stare at the black athletes. “I felt like a sideshow freak,” Covington said. Once, the trio hid in the bushes at a popular lookout to avoid a carload of angry teenagers who suspected the players were dating white girls. A local restaurant offered a steak dinner to any player who hit a homer for the home team, a promotion cancelled, according to the book A Summer Up North, by Jerry Poling, after patrons complained of sharing the dining room with blacks. Covington smashes into wall (see below). Aaron hit nine home runs that season, while Covington swatted 24, including four grand slams. “If people had known that one of our players would someday be the all-time, major-league home-run leader,” Aaron later wrote in his memoir, “everybody would have assumed that Covington would be the guy.” Aaron surpassed Babe Ruth’s mark of 714 homers in 1974. Covington lost two seasons of pro ball to military service, during which he played for an army team at Fort Lee, Va. On his return to civilian life, the outfielder was assigned to Jacksonville, Fla., where he led the South Atlantic League in hitting with a .326 average. The circuit, known as the Sally League, was not a kind one for black athletes, who were refused admission to restaurants and played before segregated crowds. 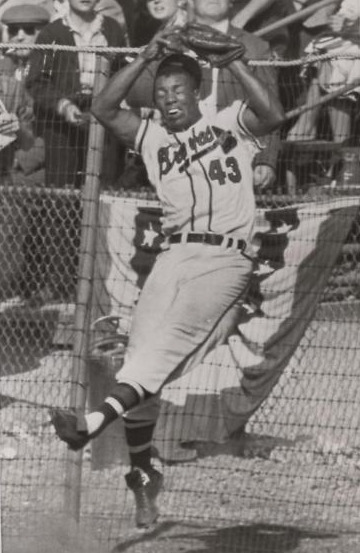 The 6-foot-1, 205-pound slugger gained promotion to Milwaukee in 1956, assigned part-time duty in the outfield. A month into the 1957 season, Covington’s uncertain defence and a drought at the plate led to a demotion to Wichita, Kan. A month later, he returned to the parent club. He also had a ritual that drove opposition pitchers to distraction, a “spike-knocking, cap-adjusting, hand-dusting, shoe-tying, uniform-tugging and bat-waggling” production that Baseball Digest called more intricate than the Bolshoi Ballet. In 1957, the Braves claimed the National League pennant by eight games over St. Louis, relying on a pitching rotation featuring the veteran Warren Spahn. Milwaukee boasted a solid offence, as Aaron hit 44 homers and third baseman Eddie Mathews contributed 32. Covington finished the season with 21. (The left-handed batter also hit eight triples, but only four doubles, a statistical oddity.) The Braves benefited from the late-season addition to the roster of Bob (Hurricane) Hazel, who hit a spectacular .403 in 134 at-bats over the final 41 games. The team celebrated the pennant with a motorcade, Covington joining Aaron in a convertible. The World Series against the New York Yankees opened with Casey Stengel, the rival manager, describing Milwaukee as a “bush town,” inflaming Braves fans. The city and its players would prevail in seven games, after plenty of dramatics, highlighted by Covington’s two catches. In Game 2, with two Yankees on base and two out in the bottom of the second inning of a 1-1 game, Bobby Shantz lined a scorcher to left field. Covington, who had been playing shallow, gave chase, reaching out with his glove to snare the ball backhanded over his head. “It was going away from me,” he said after the game, “but it stayed up just long enough for me to get it.” The Braves won, 4-2. In the fourth inning of Game 5, Covington raced back to chase a ball smashed by Gil McDougald. The outfielder collided with the fence just as the ball arrived in his outstretched glove. Covington tumbled to the ground and rolled, a sensational image captured in a series of photographs published in newspapers the following day. “I didn’t know for sure until I started untangling whether I still had the ball,” he said. The Braves won that game, too, by 1-0, as once again Covington’s skill made a victor out of Lew Burdette. “I carry Covington along as my personal outfield insurance,” the pitcher quipped. The Braves’ triumph was featured on the front page alongside news of ugly efforts to prevent integration of an Arkansas high school. The Yankees got their revenge the following season, defeating the Braves in seven games to reclaim the world title. 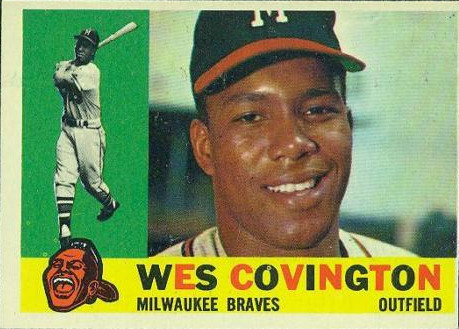 Covington stayed with the Braves until May, 1961, when he was selected off waivers by the Chicago White Sox. 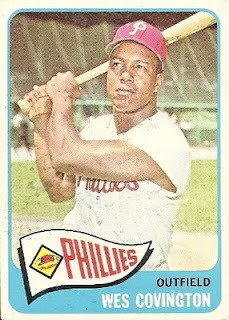 A month later, he was traded to the Kansas City Athletics, who held on to the outfielder for 23 days before trading him to the Philadelphia Phillies, his fourth team that season. He remained with the Phillies through their infamous swoon in 1964 during which they squandered a solid lead and failed to win the pennant. “Those Phillies just never had any faith in themselves,” he once said. Covington was traded to the Chicago Cubs in 1966, but was released early in the season. The Los Angeles Dodgers signed him as a free agent. His role was a minor one as an extra power hitter and a “holler guy” on the bench. He made a single appearance as a pinch-hitter in the World Series that fall. He struck out. Over 11 seasons, he recorded a .279 batting average. He also hit 131 home runs. It was rare for retired black players to be hired as coaches and none had yet been made a full-time manager even two decades after Jackie Robinson broke the modern colour barrier. In time, he moved to Canada, eventually settling in Edmonton, which he had visited while on his way to a hunting trip in British Columbia. He operated a sporting-goods business before becoming an advertising salesman at the Edmonton Sun. Covington represented the Edmonton Trappers, a minor-league team, as a goodwill ambassador and helped with promotions. Once a week, he ushered children onto the field to meet players and members of his eponymous club got certificates bearing his autograph. The athlete was afforded a rare honour when a housing development in Orlando, Fla., named streets after prominent African-American figures. Covington Street intersects with Attucks Avenue, Belafonte Lake and Liston Court. Covington died of cancer in Edmonton on July 4. He leaves his third wife, Pat, whom he married in 1990. He also leaves two daughters, five stepchildren and 12 grandchildren. He was predeceased by a daughter and a brother. In retirement, he developed and registered a trademark for a product called the Wash My Back Towel With Handles, a product for those whose mobility makes it difficult to dry off after bathing. One of the towels was presented to each mourner who attended a celebration of his life. 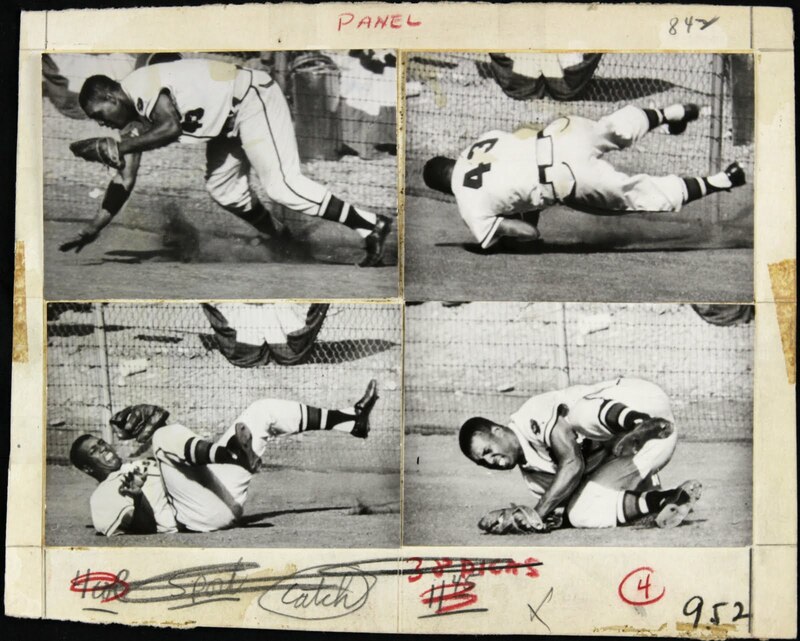 Photographic sequence shows Wes Covington tumbling after colliding with the outfield fence in Game 5 of the 1957 World Series. He said he did not know whether he had caught Gil McDougald's long drive until after he got untangled. Wes Covington's 1960 Topps card. 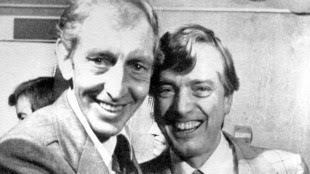 Victor Stephens (left) celebrates his 1978 byelection victory in Oak Bay with Dr. Scott Wallace, whom he succeeded as MLA. Stephens is the last Conservative to have been elected to the B.C. Legislature. The last man to have been elected to the B.C. Legislature as a Conservative is the answer to a trivia question. 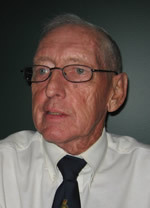 Victor Stephens, a lawyer, won a byelection in the province’s wealthiest riding in 1978, only to be defeated the following year. He soon after quit as party leader. His party has wandered in the wilderness for decades, as one obscure leader after another failed to revive the party of Sir Richard McBride and Simon Fraser Tolmie. The Conservatives are back in the news under the leadership of John Cummins, a former member of Parliament who is stumping the province to re-establish his party as a right-of-centre alternative to the governing B.C. Liberals. In June, he pressed the flesh at a meet-and-greet event at a steakhouse in Williams Lake. Earlier this month, he toured Vancouver Island with stops at golf clubs in Chemainus and Port Alberni. Last week, his party launched a website and a radio advertising campaign against a gas tax. It feels like this much fuss has not been made about the Conservatives since the war years and the glory days of Royal Leatherington Maitland. Mr. Stephens quietly cheers on the effort to resuscitate a party with a name of greater historical resonance than electoral success. The former leader turned 80 earlier this year. He long ago dropped from the political scene and is now so far removed from the hustle-bustle of city life that he can only be reached by satellite phone. The picturesque valley is home to such predators as wolves, cougars, coyotes, and bears (grizzly and black), so perhaps a spell in politics was good preparation for his retirement in the wilderness. Mr. Stephens was born in Calgary to a blacksmith who had been wounded in action in France during the Great War. Victor attended the University of British Columbia, where he competed as a miler and cross-country runner. (One of his teammates was Jev Tothill, a future leader of the B.C. Liberals.) He went into law keen to help individuals being confronted by banks, insurance companies, or large corporations. After a friend died suddenly of a heart attack, Mr. Stephens convinced his wife and three children, aged 10 to 14, to sell all their possessions and to drop out from civilization for a “Robinson Crusoe year in the New Hebrides” (now Vanuatu). The lawyer worked as a native advocate representing islanders facing criminal charges in court. Back in British Columbia, he was encouraged to succeed Dr. Scott Wallace as party leader and to contest his Oak Bay seat in a byelection. Mr. Stephens won the constituency with 38.5 per cent of the vote. The victory party was held at the local Boy Scout hall. A year later, he led the Conservatives in a B.C. election in which only Socreds and New Democrats won seats. During the campaign, which was held during a national election, he squabbled with Joe Clark, the federal Progressive Conservative leader. In the end, the B.C. Conservatives’ share of the vote increased modesty, to five per cent, but he lost the party’s lone seat, finishing in a disappointing third place. The B.C. Conservatives have not won a seat since. “I gave everything I had. But the timing was bad, that’s all,” he said. “There was a great fear of splitting the vote between the right-wing parties and allowing the NDP to get in. That was pretty much insurmountable. After returning to law, he watched his party slowly unravel. His successor as leader quit to cast his lot with the Western separatists. It has been a rough 33 years for die-hard B.C. Conservatives. Even Mr. Stephens has let his membership lapse. He no longer has the stomach for politics. 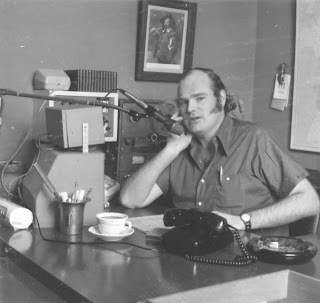 Gary Bannerman was a tough interviewer and an acerbic commentator in a long career on Vancouver radio. Photograph from B.C. Radio History. Three desperate prisoners holding 15 hostages at knifepoint in a prison vault invited a popular radio host to enter their stronghold. Gary Bannerman reported the redoubt had only a narrow entrance, affording inmates the chance to harm hostages should an assaulted be attempted. Ominously, he said the prisoners warned that “blood will flow” if their demand for safe passage out of the country was not met. A 41-hour standoff ended when guards stormed the area, shooting to death one of the hostages. While prison authorities ordered a news blackout, Bannerman went on the air to describe the siege. The incident at the B.C. Penitentiary was the bloodiest and most dramatic of three hostage-takings by prisoners in 1975 in which Bannerman was asked to be an intermediary. The others involved inmates with psychiatric problems, both of which ended after radio station CKNW aired interviews with the troubled men. Bannerman, who has died of what the station describes as liver complications, aged 64, was a newspaper reporter who became the top-rated radio host in Vancouver, a city with a long history as a hotbed for hotline radio. A tough interviewer and an acerbic commentator, he generated plenty of legal actions, including more than 150 libel cases, according to Top Dog!, an official history of the station published in 1993. The claim is made he never lost one, but that is radio ballyhoo. At least two cases were settled out of court. He was also once found guilty of criminal contempt of court. As well, he was censured by radio’s governing body for making “racially abusive remarks” about First Nations people. Bannerman did not particularly care if he won over the listening audience with his opinion. “People agree and disagree and I’d be an insufferable idiot if I tried to get everyone to agree with me,” he told TV Week magazine in 1979. With a balding pate and dramatic sideburns, he favoured a workday wardrobe of a short-sleeve shirt with a tie loosened at the neck. The Globe once described him as “a large smooth egg of a man,” while the columnist Allan Fotheringham called him “the Orson Welles of CKNW.” The hint of a compliment in Fotheringham’s description — Welles had a lovely voice — was likely trumped by the auteur’s corpulence and fondness for alcohol. Gary William Bannerman was born on May 23, 1947, at Sydney, N.S. In Centennial Year, he was hired by the Saint John (N.B.) Telegraph-Journal as an obituarist, soon after gaining promotion to cover the New Brunswick Legislature. He made a strong impression and by 1970 had been hired by the Province in Vancouver. Two years later, CKNW launched a program called The Investigators, featuring two hosts and a news legman. The show was a bid to make up for the loss to rival CJOR of top radio personality Jack Webster, the hard-hitting interrogator from Scotland known as the Oatmeal Savage. Two months later, Bannerman, who had been covering City Hall, was lured away from the daily. In time, the show and its coveted 9 a.m. to noon time slot would be all his. He had been on air less than a year before an editorial about police policies led more than 700 irate listeners to call the station to complain. He exposed crooked car dealers and corrupt businesses. The daily outrage expected of a talk radio host was leavened by occasional display of a light touch. Bannerman never revealed a party affiliation, though his antipathy to the NDP and his admiration for Social Credit did not harm his standing with station management, or with advertisers. In February, 1974, he aired a three-hour show during which he castigated the NDP government of Premier Dave Barrett for buying companies and shares on the Vancouver Stock Exchange. The premier cited six remarks he described as malicious libel and demanded an apology for himself, his cabinet, and his caucus. Bannerman’s comments did lead to an apology and an out-of-court settlement, but not with the premier. An undisclosed sum was paid to four former associates of Dunhill Development Corp. Ltd., who felt the broadcast alleged that they had engaged in improper insider trading. Just a month after that contentious show, the B.C. Court of Appeal issued an injunction prohibiting the repetition of what the judges described as “grossly defamatory language” in a program in which Bannerman and others described the activities of the Church of Scientology. Bannerman was found guilty of criminal contempt of court in 1979 after accusing William Faulder (Fats) Robertson of being a “leading member of the Mafia” in a broadcast. Robertson was on trial at the time on cocaine smuggling charges, for which he was found guilty and sentenced to a long prison term. Despite offering “deep apologies,” the hotline host was fined $4,000, as was the radio station. In 1985, Bannerman delivered an editorial about a Victoria lawyer who had been in the news while representing Holocaust denier Jim Keegstra and Nazi apologist Ernst Zundel. “Doug Christie has aligned himself so many times with these perverted monsters that he has to be viewed as one himself, in my view,” Bannerman said. The lawyer sued for libel. A jury decided the comments were defamatory, but fair comment. In 1988, Bannerman went on extended sick leave, replaced in his coveted time slot by Rafe Mair, a former Socred cabinet minister. He returned to the station as a replacement host in the 1990s, but his run at No. 1 was over. Bannerman wrote several books, including a helpful history of BC Ferries, on whose board he would serve, as well as two well-received guides to the cruise-boat industry. His most recent book, Squandering Billions, co-authored with Dr. Don Nixdorf and published by Hancock House six years ago, examines health-care spending. In 1974, he co-founded Bannerline Enterprises, a communications company, with his wife, Patricia, a painter and photographer. She survives him. He also leaves a brother, two sisters, and his mother. Jake West, a busker who performs with a duo called Both Sides of the Coin Circus, is also appearing this summer on stage with the Canadian Pacific Ballet in Victoria. In high school, Jake West was a wisecracking, troublemaking smart-aleck, the hyperkinetic guy who’d do anything — anything — to make the other kids laugh. In Grade 8, he mimicked a French teacher by leaving his desk to imitating her every move. His classmates howled. “Who doesn’t like the class clown?” he asked. Well, Grade 8 French teachers, probably. Principals, for sure. Some goody two-shoes classmates. What once got him sent to the office now gets him showered in coin. Mr. West, 36, is a circus artist who has spent years working the streets as well as stages. He joins colleague Chris Murdoch in an act called Both Sides of the Coin Circus, one of the acts performing during the inaugural Victoria International Buskers Festival being held this week. As it turns out, Mr. West skipped the opening days of the street festival as he had earned an audition in Toronto with the Cirque du Soleil. Imagine. You are a street performer whose city is playing host to a festival of street performers and you have to be out of town because you’re trying to gain a spot with the greatest show on earth. The Cirque’s tryouts are not for the fainthearted. Mr. West and 29 other aspirants had just two minutes — 120 seconds — to show off what they had learned in a lifetime of making others laugh. Good news or bad, he need to fly home immediately afterwards to perform Sunday in three shows on the grey, cold and misty summer streets of Victoria. The buskers festival, which runs until July 24, features clowns and comics and jugglers and magicians and a one-man band (Victoria’s own Dave Harris) and a choreographed pyromaniacal show and whip-cracking, flame-eating acrobats and Bendy Em, who performs “comic contortions of epic proportions” by squeezing herself into a 16-inch box. 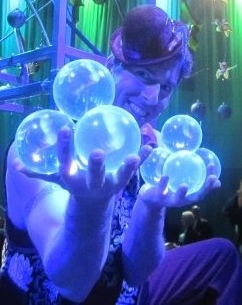 The show by Messrs. West and Murdoch includes clowning and contact juggling, which involves manipulating a crystal ball by rolling it along the body. On Tuesdays and Wednesdays this summer, Mr. West can be seen on stage performing contact juggling alongside dancers of the Canadian Pacific Ballet in shows at Market Square in Victoria. The performer moved to Victoria a year ago after a stint as a teacher in Japan. Born in Quebec, he is the son of a secretary and a psychiatry professor. The class clowning led to his dropping out of high school, but he later earned a degree in East Asian studies. While the 36-year-old entertainer prefers to do corporate work these days, he acknowledges Victoria’s Inner Harbour Causeway as a busker’s paradise. The city issues about 400 buskers licences, while the Greater Victoria Harbour Authority regulates entertainers on the Causeway. Amplification is banned. Bagpipers, whose skills are perhaps best appreciated on Robbie Burns Day or when staring down the Hun across No Man’s Land, are restricted to one street corner. When a hooligan recently assaulted the busker known as Darth Fiddler, a violinist who wears a Star Wars costume, the police issued alerts on Twitter and released surveillance video of a suspect fleeing. A local music store replaced the busker’s damaged instrument. Drunks, hoodlums and indifferent passersby are occupational hazards in a craft in which the attractions might not seem so readily apparent. The audience’s verdict can also be disheartening. A busker faces more rejection in a day than a salesman might in a lifetime. At the Cirque audition, Mr. West did not survive the first round of cuts. The talent scout told him he was “holding too much tension,” an assessment about which he could not disagree. Afterwards, he realized he had never auditioned before. He will be trying again. BOOK ’EM: Tall Tale Books, the mom-and-pop operation seeking 400 supporters pledged to buying books every month, ended their campaign on Canada Day short of the goal. A late surge brought the total to 318. After consideration, Kate and Drew Lorimer will be keeping the doors open to their airy children’s bookstore on Fort Street in downtown Victoria. New book shipments arrived this week. See Kate and Drew breathe a sigh of relief. Little-known floorball gaining a shine in B.C. Sweden and Finland battle in the finals of the 2008 Floorball world championships. The game is called floorball. It is played indoors. Each team has five players with plastic sticks who whack a plastic ball. The goalies don’t get sticks, so when stopping shots they look like drowning men going over Niagara Falls. The game is popular in Europe. The Finns like salibandi like they like sauna. The Swedes like innebandy like they like loganberries. The Swiss like unihockey like they like emmental, chocolate and cuckoo clocks. Representatives from those three countries formed the International Floorball Federation in 1986. They tried to spread their message. After five years, only Denmark and Norway had joined, a sweep of Scandinavia. Iceland joined six years ago. In time, though, floorball spread to Asia and Australia. Tiny Liechtenstein came aboard. Sierra Leone, too. Now, some 53 countries belong. A week ago, the International Olympic Committee rewarded floorball with full recognition, a major step towards the sport winning a coveted slot in the Olympics. The federation is now gunning for inclusion in the 2024 Summer Games. The happy news thrills a small but dedicated band of players — and proselytizers — in British Columbia. “It gives the sport a ton of credibility,” said Greg Beaudin, president of the B.C. Floorball Federation. That will take time. Floorball is so unknown on these shores that it can’t even pass spell-check. The game is played at the Richmond Olympic Oval and at the Roundhouse in Vancouver’s Yaletown; in Trail and Terrace; in Nanaimo and Victoria. Recently, the school in Fraser Lake, near Vanderhoof, purchased a full set of equipment. “It’s sprinkled out there,” Mr. Beaudin said. The sport has been used as a training tool by Hockey Canada for a decade, but is only now beginning to gain popularity among the general public. The limited equipment — no helmets, no shin pads, no shoulder pads, no elbow pads, no gloves — makes it inexpensive. The restrictions on body checking — only soccer-style shoulder to shoulder contact is permitted — limits injuries. Mr. Beaudin, 42, grew up in a hockey household. His father is Norm Beaudin, a journeyman whose 16-season professional career includes stints in the National Hockey League. With the Winnipeg Jets, he skated on the Luxury Line with Bobby Hull and Christian Bourdeleau. Now, the father sells sporting goods in Florida, including among his stock floorball sticks and balls. The son was introduced to floorball just five years ago during a demonstration in Toronto. A net was set up for fans to take shots with floorball sticks, which have rounded handles and plastic blades through which air can pass. He was quickly sold on the sport. Many of the Swedish and Finnish players in the NHL played the sport as children, and some do so to stay in shape in the off-season. Sami Salo, the fragile Vancouver Canucks defenceman, tore an Achilles tendon playing floorball last summer. These days, one of the more popular brands of floorball equipment carries the name of Borje Salming, the retired star defenceman for the Toronto Maple Leafs. A year ago, Mr. Beaudin got to play floorball with several of the current Canucks. Some of the Swedish-born Canucks such as Henrik Sedin and Alexander Edler wanted to show the sport to Ryan Kesler, an American, and Kevin Bieksa, a Canadian. Mr. Beaudin is among those who dream of the day when a Golden Goal for Canada will come not on the ice, but the gymnasium floor. Their slogan: One world, one ball, floorball. Today, some elementary-school gymnasium in the British Columbia Interior. Tomorrow, the world. 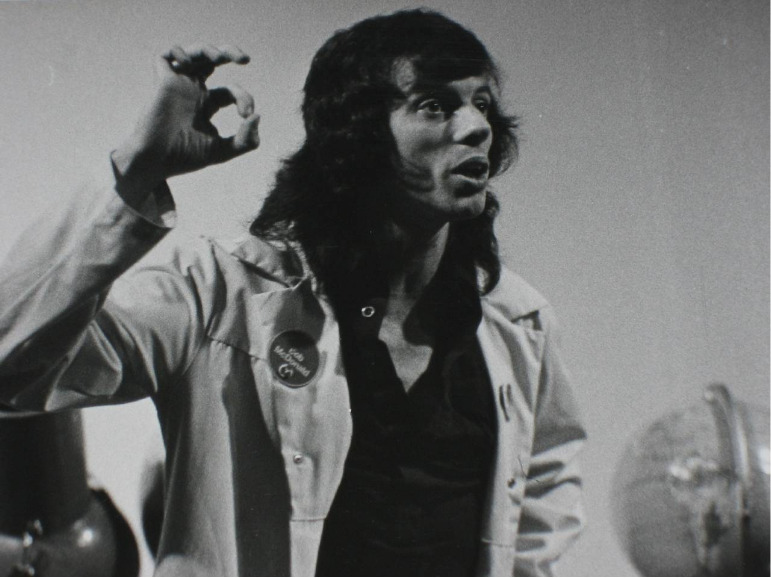 Bob McDonald of CBC Radio's Quirks & Quarks got his start as a science educator doing demonstrations at the Ontario Science Centre in Toronto. HYPOTHESIS: Life is better on the West Coast than in the centre of the universe (aka Toronto). TEST SUBJECT: The host of CBC Radio’s Quirks & Quarks. PROCEDURE: Sail the Salish Sea before testing the waters of the Inside Passage. DATA COLLECTION: Take each sunny summer day as it comes. Bob McDonald, the hyperkinetic science enthusiast recently named to the Order of Canada, no longer classifies himself as Homo sapien Torontosaurus. He has just moved into a century-old bungalow in Victoria’s Fairfield neighbourhood. Technicians will install a studio in a basement room from where, sometime next year, he will celebrate his 20th anniversary as host of the popular radio program. On the weekend of the launch of the final Space Shuttle mission, a broadcaster who has covered the program for 30 years, including witnessing three launches in Florida, could be found navigating the calm waters off Sidney. “When I’m not Mr. Science, I’m Capt. Bob,” he said aboard his 41-foot Morgan sailboat. Mr. McDonald will spend his first months as a resident of Victoria exploring marine reserves, enjoying mountain parks, “and, of course, waiting for the Big Earthquake. I hope to be on my boat when that happens,” he quipped. The newcomer has already adopted a jaded local’s insouciance about the activity along the Juan de Fuca Plate. The self-described space nut considers geology his second great scientific passion. As he contemplated a coastline backdropped by mountains and volcanoes, he described it as “the crumpled fender of North America as we slam into the floor of the Pacific Ocean.” That’s the kind of simple but memorable metaphor that has made him so popular a science educator. The surprising truth is that this recipient of six honourary degrees, as well as a prestigious honorary life membership in the Sigma Xi Society, has not had advanced formal science education. At university, he studied arts and philosophy. He also performed on stage. Fans of the irrepressible educator will not be surprised to learn he was cast as Grumio, a fool, in The Taming of the Shrew and as Puck, a jester, in A Midsummer’s Night Dream. “Leapt all over the stage, had a lot of fun,” he said. Born in Wingham, Ont., to parents originally from New Brunswick, he grew up in Orillia, the picturesque lakeside city that provided the inspiration for Stephen Leacock’s Mariposa. His father laboured as a brass moulder in a foundry, dying young. His mother took odd jobs to keep the family together. The boy took a keen interest in the race to space. “I remember Sputnik and watched all the moon landings — all of them, not just the first one, and stayed up late at night watching them,” he said. As a young man, he earned a living as a truck driver working for a sign company that made billboards. One day, he drove his 10-ton stake truck to the Ontario Science Centre in Toronto deliver a resumé. He was ushered in and met a manager. “I just blathered on about why I thought the science centre was such a fabulous place and why I wanted to work there. He said, ‘You’re the kind of guy we want. You’re in.’ ” The manager had not even had time to read the application. Soon, he was on stage performing science demonstrations. He still often makes classroom appearances. These days, he finds many of the brightest students are information rich but knowledge poor. They have facts, or know where to find them, but do not possess fundamental knowledge of the scientific world. As for the Space Shuttle, he admits he was never a fan of a “magnificent machine” that “doesn’t go anywhere. It only goes 400 kilometres up.” That distance is not quite the length of Vancouver Island. CONCLUSION: It does not take a rocket scientist to determine whether life is better in Lotusland than in The Big Smoke. Victoria librarians Avi Silbertsein and Leah Pearse caused a ruckus with their provocative display for Freedom to Read Week in 2010. A man cycles along the sidewalk, the neck of an acoustic guitar poking up from his backpack. He stops at a table on the sidewalk, taking one foot off a pedal to lean over a plastic tub filled with paperback books. Finding a volume to his liking, he stuffs it in his pocket before cycling away. On Tuesday morning, Literacy Victoria’s Bookmobile set up shop on the sidewalk outside the Our Place drop-in. On the sidewalk, patrons perused an impressive collection of books by the likes of Margaret Laurence and D.H. Lawrence. The authors ranged from Airport Popular (Tom Clancy, Robert Ludlum) to Canadiana (Joy Kogawa, Jack Hodgins) to High Falutin’ Literature (E.M. Forster, Henrik Ibsen). An entire English undergraduate curriculum was there for the taking. Another man made a selection. “Remind me of your first name,” said the Bookmobile’s Avi Silberstein. “Travis,” repeated Mr. Silberstein, recording on a notepad the genre of the volume. “That’s all I have to do?” Travis asked. At the Bookmobile, you do not need money, or identification, or an address. All you need is a desire to read. Even if you have nothing, you can always have that. Paul Stevens, 43, who lives in his van, is an aficionado of whodunits, police procedurals, and murder mysteries. He credits reading as an aid to staying sober. He spoke like a poet. His thoughts were echoed by another client. The Bookmobile is a three-cylinder, right-hand-drive Honda truck owned and driven by Madeline Bakker, a former social worker. Earlier in the morning, the Bookmobile puttered around town, donated paperbacks stored in five plastic tubs in the open rear bed, making stops at a Salvation Army residence and at the common room of a housing cooperative. A food bank and a woman’s shelter are also on the route. 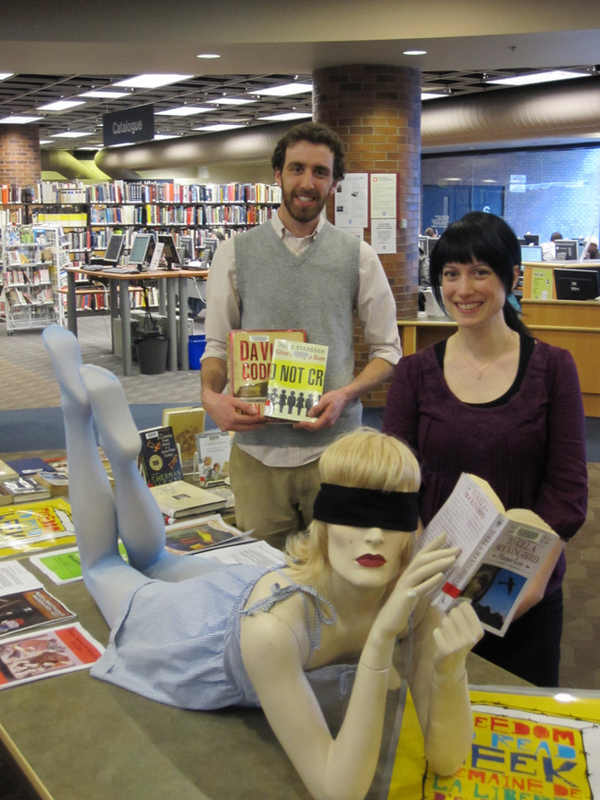 She is joined on her rounds by Mr. Silberstein, 28, of the Greater Victoria Public Library. The lanky librarian, who was born in Santiago, Chile, earned a masters degree in library science after a stint as an organic farmer. He is the son of a school librarian and grew up in a household in which television watching was permitted only on weekends. His title is outreach librarian, so when he is not staffing the reference desk at the downtown library, he develops programs in which the library’s holdings are made more available. One innovation involves providing books for reading — but not lending — in the waiting rooms of such places as a public health clinic and a refugee centre. The stock on offer includes non-fiction titles which can be read in snatches, as well as books of photographs. The program is called Library While You Wait. During the summer, Mr. Silberstein can be found on two wheels followed by a trailer — a “little library on wheels” — offering children’s books and beach reads to the public. These are loaned out to patrons with valid library cards. He can also issue cards. On Saturday, he will pedal his Bikemobile to the Moss Street Market before cycling eastbound on Oak Bay Avenue to Willows Beach. The ka-ching, ka-ching of his bell is the sound of books on the move. If the people can’t come to the library, take the library to the people. 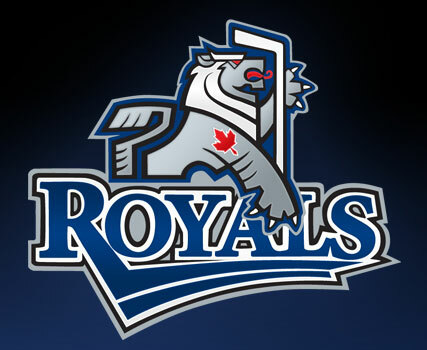 A stylized heraldic lion is the logo for the new Victoria Royals of the Western Hockey League. It was designed by the same artist who gave the Vancouver Canucks their breaching orca. After the owners settled on calling their hockey club the Victoria Royals, the artist Brent Lynch went to work. Royals is a good match for a city named after a monarch. But how to capture the sentiment in a single, punchy image? Queen Victoria wielding a hockey stick? Too cartoony. The commission to create a Royals logo for the team’s upcoming debut season marked a rare return to the graphic arts. The 57-year-old artist is more of a painter these days, having moved to Nanoose Bay on Vancouver Island three years ago. His works are sold in galleries throughout British Columbia and as far afield as San Jose del Cabo, Mexico. Though he has been widely exhibited, he is not best known for his landscape oils. Everyone knows his work, though no one knows his name. His artwork has been likely worn by more people in more places than any other in the province. It is popular with students and retirees, businesspeople and homemakers. You can find it in baby cribs and gangsta cribs. Judging by recent unsavory events on Vancouver streets, even yahoos and yokels like it. Before dedicating himself to painting, Mr. Lynch had a long career as a graphic designer. Among his clients was a certain hockey team for whom he developed an image that was ubiquitous last month. The breaching orca representing the Vancouver Canucks? That’s the handiwork of Mr. Lynch’s fertile mind. The letter C from which it breaches was selected to give the Canucks’ sweater a classic look, as though it was an Original Six team. The artist also prepared a lumberjack image of a bearded Johnny Canuck character, but the ownership at the time did not care for it. He has been doodling for as long as he can remember. Family lore has the boy scrawling on floors and bedroom walls as a toddler, once even using as a canvas his baby brother’s bald head. His mother was an artist and his father owned a grocery in Ladner, where he held Hawaiian Days and Cowboy Days sales, the colourful graphics associated with the events inspiring a boy who liked to draw. In school, Brent cartooned when he should have been listening, his caricatures earning him the admiration of his classmates if not of his subjects. He attended art school in Vancouver and London, England, before getting a job as an illustrator with the Vancouver Sun, whose editorial cartoonists at the time were Roy Peterson and the peerless Len Norris. Mr. Lynch soon after left to form his own eponymous design firm. He has designed album covers and advertising campaigns, opera broadsides and sporting posters, beer labels and corporate logos. For the Royals, he created an heraldic lion. The beast is rampant (rearing on hind legs) and langued (exposing tongue). The beast holds an upside-down hockey stick where tradition might dictate a flagpole. Sometimes, Mr. Lynch finds a home even for rejected work. The Johnny Canuck character he designed for the Canucks ended up as the image for the Vancouver Giants junior hockey team. It features a Paul Bunyonesque character carrying a hockey stick, instead of an ax, over his shoulder. By coincidence, the Giants will travel to Victoria for the Royals’ inaugural Western Hockey League game on Sept. 24. All the skaters will be wearing Lynch logos. Barry Wilkins shovels a backhander along the ice past goalie Denis DeJordy to score the first goal for the Vancouver Canucks in their National Hockey League debut. Wilkins, a tough defenceman, was playing only his ninth NHL game. It was his second career goal. The marker made him the answer to a trivia question and something of a folk hero to Vancouver's long-suffering fans. Barry Wilkins, who has died, aged 64, scored the first goal for the Vancouver Canucks in their National Hockey League debut. The bruising defenceman, playing in only his ninth NHL game, showed the poise of a veteran sniper on the play. He performed a spinning manoeuvre followed by an unlikely rush to the net. 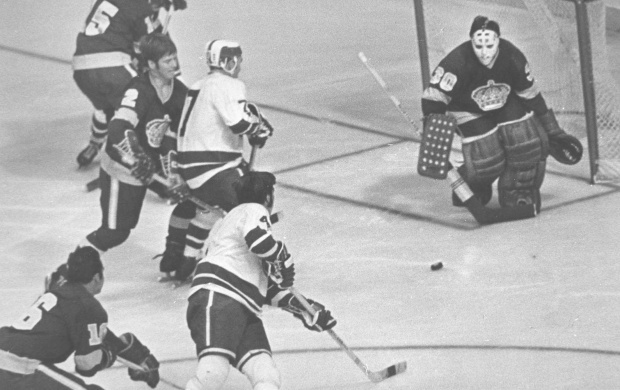 A backhand shot fooled Denis DeJordy in the Los Angeles Kings net. Wilkins scored at 2:14 of the third period, on an assist from Len Lunde. The Canucks went on to lose by 3-1 the historic game played at the Pacific Coliseum on Oct. 9, 1970. With his Beatles haircut and muttonchop sideburns, Wilkins was readily identifiable on the ice. Like so many of the original Canucks, he compensated for a lack of skill through hard work. Barry Wilkins in 1971-72 O-Pee-Chee card. Barry James Wilkins was born on Feb. 28, 1947, in Toronto. He played junior hockey with the Oshawa (Ont.) Generals, where he was a teammate of Bobby Orr. He played eight games over three seasons with the NHL’s Boston Bruins, but could not break into a stellar defensive corps featuring Orr. The Canucks selected Wilkins with their ninth pick in the 1970 expansion draft. With earlier selections, Vancouver chose defencemen Gary Doak, Darryl Sly, and Pat Quinn, a future coach and general manager for the team. At 5-foot-11, 190-pounds, Wilkins was known for his bruising body checks. 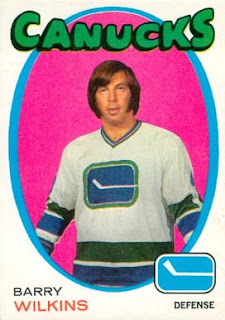 He spent four full seasons with the Canucks before being traded to the Pittsburgh Penguins early in the 1974-75 season. He later jumped to the World Hockey Association, where he skated for the Edmonton Oilers and Indianapolis Racers. After retiring from hockey, he moved to Arizona, where he worked for the Coca-Cola company. 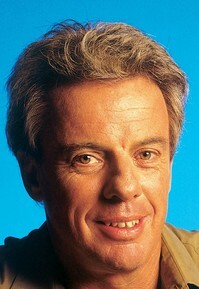 He died of lung cancer on Sunday (June 26) at Chandler, Ariz. He leaves his wife, Marilyn; a son; two stepsons and a stepdaughter; nine grandchildren; and, two great-grandchildren. Last year, Wilkins returned to Vancouver for events marking the club’s 40th anniversary. Joined at centre-ice by former captain Orland Kurtenbach, Wilkins, wearing a No. 4 sweater, dropped the puck for a ceremonial opening face-off. The disk was the one with which he had scored the Canucks’ first goal. I’m starting the day with precisely $61. That’s a Mackenzie King red bank note ($50), a purple John A. Macdonald ($10), and a golden loonie coin. Plenty of dough for someone in search of three square meals. My day usually begins with simple coffee and toast, or perhaps some pan dulce (Spanish for sweet bread), but since this is being done on someone else’s dime, let’s splurge with restaurant meals. We’re doing the 9-to-5 today, so we’re hunting for a standard bacon-and-eggs breakfast instead of a fancy brunch. The workday is to be spent near the Inner Harbour, so we’ll limit the hunt to the downtown area. John’s Place at 723 Pandora Ave. has long been a place to go for yeast-batter Belgian waffles ($6.25) with dark roast coffee ($2.75). That’s $9. Or we can launch the day with brekkie at Mo:Lé, at 554 Pandora, where one of the morning specials is the Simon Whitfield Yam Omelette (“eat like an Olympic champion”). That’s $13 for a heaping helping of health. For lunch, let’s splash into a big bowl of barbecue pork and wonton noodle soup at Wah Lai Yuen, 560 Fisgard, for $9.50. Comes with Chinese tea. My other choice would be a pulled pork sandwich ($6.50) with a side of beans ($1.75) and cornbread ($1.75) with ice tea ($1.50) at Pig BBQ Joint, 1325 Blanshard. Southern comfort? I’m in a Southern coma after that delicious pig out. Some other possibilities for the midday meal: five tacos de pollo on handmade corn tortillas for $5 at Hernande’z Cocina, a slice of El Salvador located in the ground-floor walkthrough of an office building at 735 Yates St.; or, some Ocean Wise-approved, tempura-battered halibut fish ’n’ chips ($13) at Red Fish Blue Fish in the converted shipping crate on the pier below 1006 Wharf St.
Supper is an easy call for me. One of two places. At Zambri’s, I’d start with fried mozzarella ($9) followed with lamb shank contadina ($30). At Brasserie l’Ecole, I’d scarf a couple of oysters on the half shell with sweet, sour and spicy mignonette ($2.50 each) followed by steak frites ($23 for the 8 oz. sirloin). Rare, of course. What a feast. Three terrific meals by local chefs in some of the city’s best restaurants. Alas, my personal budget does not permit three restaurant meals per day on any day, let alone on every work day. Few jobs permit such profligacy. One that does is to be an elected servant of the people. Look in the finance ministry’s Core Policy and Procedures Manual. Under the travel section, in paragraph four of subsection 10.3.7, it says members of the Legislative Assembly can claim a $61 meal allowance each day they’re working. Last year, reporter Rob Shaw of the Times Colonist reported that Liberal cabinet minister Ida Chong had claimed $5,921 in meals in 2009. This seemed a large sum, not the least because a) Chong is moderate in character, not gluttonous, and, b) her home, no doubt outfitted with a kitchen, is no more than a 20-minute drive from the Legislature. Asked for comment, the Opposition NDP declined to complain, giving rise to the reasonable supposition that its local members, too, were claiming $61 in daily meal money. The MLAs do not even need to submit receipts. It’s a sweet deal that leaves me with indigestion. Being an MLA is not easy. The hours are long, the files complicated, the public demanding. For this, they are well recompensed. Elected representatives earn a base salary of $101,859, with many of the 85 MLAs earning substantial additional salaries for other roles (premier: 90 per cent extra; cabinet with portfolio, 50 per cent extra; government whip, 20 per cent extra). Even a lowly deputy chair of a committee earns an extra $10,185.90. We are not talking about people barely able to make ends meet. Or buy your own lunch with your own dime, just like all the rest of us mop-wielding, pencil-pushing, working stiffs. Some of the people serving high-on-the-hog politicians earn minimum wage, which increased to $8.75 per hour in May after having been frozen at $8 for a decade. That’s $70 per day in earnings, before taxes. The $61 food allowance is a gravy train that needs to be derailed.